Vichy's first mineral mask is enriched with Vichy Mineralizing Thermal Water to boost hydration and soothe thirsty and uncomfortable skin. This refreshing water-gel with a light fragrance of green tea, jasmine water and bamboo acts as a cold glass of water for the skin offering a long-lasting cooling effect and instant freshness. The Mineralizing Thermal Water strengthens for stronger healthier-looking skin. While Vitamin B3 calms inflammation, soothes skin and leaves skin looking radiant and Glycerin hydrates the skin. 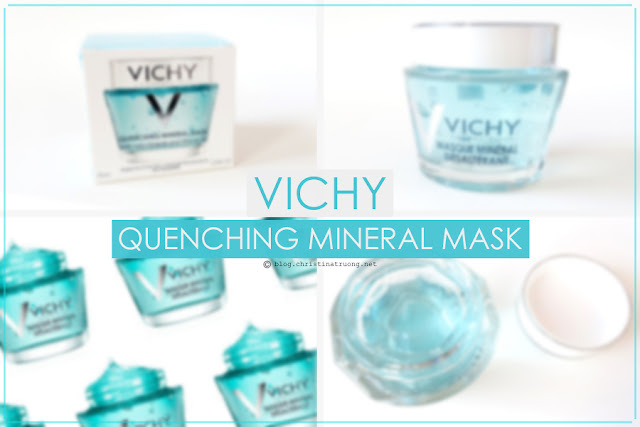 The Vichy Quenching Mineral Mask is a clear mask and has a gel-like texture. When applied, it feels very cooling - as if you're applying a gel moisturizer. It similarly reminds me of a sheet mask without the sheet itself. The mask stayed on the face without any product sliding or dripping. Speaking of sheet masks, after having the mask on for a couple of minutes, my face started to feel sticky - the same texture after a sheet mask is removed. I thought by tapping and massaging the product after the 5 minute mark, the product would sink into my skin. It did not. There's a love-hate relationship with the Vichy Quenching Mineral Mask. On the one end, I really like how it made my skin look and feel hydrated and smooth. On the other end, however, I'm not a huge fan of the stickiness it leaves behind. Maybe I'm not massaging the excess mask enough? What I ended up doing after letting the mask sit for 5 minutes and massaging the excess is to spritz a bit Vichy Mineralizing Thermal Water or any type of facial spray and massage the rest of the product into my skin. It seemed to do the trick and left my skin from feeling sticky. After using the mask for a couple of weeks (~3 times a week), my skin looks and feels refreshed, hydrated, and smooth. It's definitely a great mask for those who are looking for a hydrating mask. And to those who have tried Vichy Quenching Mineral Mask, let me know if you also experience the same stickiness after leaving the mask on. What are your thoughts on Vichy Quenching Mineral Mask? Have you tried any Vichy products before? What's your favourite type of mask (sheet, clay, peel-off, etc)?